To review the diagnosis and treatment of myopic choroidal neovascularization. Imaging tests currently available and the advantages of each modality for detecting choroidal neovascularization signs are discussed. The management options and the outcomes of different treatment options are also reviewed. Anti-vascular endothelial growth factor has become the preferable choice of treatment in myopic choroidal neovascularization cases with improved results. The benefits of a single injection followed by PRN dosing were supported by randomized clinical trials. Choroidal neovascularization is a common vision threatening complication in patients with pathologic myopia. Most of the patients with this condition are younger than 50 years, and the major concern is to have vision preserved later in life. The investigation of myopic choroidal neovascularization imposes additional tests to be performed in most cases. Anti-vascular endothelial growth therapy has demonstrated superior efficacy over other treatment modalities. However, further studies are required for investigation of the risk factors for recurrences and the long-term treatment strategies. The editors thank Dr. André Freitas for lending his expertise and reviewing this manuscript. Supported by the Department of Veterans Affairs, Veterans Health Administration, Office of Research and Development, Clinical Sciences Research EPID-006-15S, NIH Center Core Grant P30EY014801, and Research to Prevent Blindness Unrestricted Grant. Neelam K, Cheung CMG, Ohno-Matsui K, Lai TYY, Wong TY. Choroidal neovascularization in pathological myopia. Prog. Retin. Eye Res. Elsevier Ltd; 2012;31:495–525. Available from: https://doi.org/10.1016/j.preteyeres.2012.04.001. •• Tan NW, Ohno-Matsui K, Koh HJ, Nagai Y, Pedros M, Freitas RL, et al. Long-term outcomes of ranibizumab treatment of myopic choroidal neovascularization in East-Asian patients from the radiance study. Retina. 2018;38(11):2228-382238. Available from: https://www.ncbi.nlm.nih.gov/pmc/articles/PMC6221407. The study confirmed the long-term effectiveness of Ranibizumab over an additional 36 months of follow up in a cohort of East-Asian patients from the RADIANCE study. Liu HH, Xu L, Wang YX, Wang S, You QS, Jonas JB. Prevalence and progression of myopic retinopathy in Chinese adults: The Beijing eye study. Ophthalmolog. Elsevier Inc.; 2010;117:1763–1768. Available from: https://doi.org/10.1016/j.ophtha.2010.01.020. Ng DSC, Lai TYY, Cheung CMG, Ohno-Matsui K. Anti–vascular endothelial growth factor therapy for myopic choroidal neovascularization. Asia-Pacific J. Ophthalmol. 2017:1741–6 Available from: http://www.apjo.org/Apjo/pdf/id/551.html. Chan W, Ohji M, Lai TYY, Liu DTL, Tano Y, Lam DSC. Choroidal neovascularisation in pathological myopia - an update in management. Br J Ophthalmol. 2005;89(11):1522–8. Available from: https://www.ncbi.nlm.nih.gov/pmc/articles/PMC1772951. Wong TY, Ohno-Matsui K, Leveziel N, Holz FG, Lai TY, Yu HG, et al. Myopic choroidal neovascularisation: current concepts and update on clinical management. Br J Ophthalmol. 2015;99:289–96. https://www.ncbi.nlm.nih.gov/pmc/articles/PMC4345796/. Yoshida T, Ohno-Matsui K, Yasuzumi K, Kojima A, Shimada N, Futagami S, et al. Myopic choroidal neovascularization: a 10-year follow-up. Ophthalmology. 2003;110:1297–305. https://www.aaojournal.org/article/S0161-6420(03)00461-5/fulltext. Leveziel N, Gaucher D, Baillif S, Benouaich X, Chartier C, Grenet T, et al. Understanding the determinants of myopic choroidal neovascularization and response to treatment. Eur J Ophthalmol. 2016;26:511–6. https://www.ncbi.nlm.nih.gov/pubmed/27515571. Leveziel N, Caillaux V, Bastuji-Garin S, Zmuda M, Souied EH. Angiographic and optical coherence tomography characteristics of recent myopic choroidal neovascularization. Am. J. Ophthalmol. 2013:913–919.e1 Available from: http://linkinghub.elsevier.com/retrieve/pii/S000293941200832X. • Cheung CMG, Arnold JJ, Holz FG, Park KH, Lai TYY, Larsen M, et al. Myopic choroidal neovascularization: review, guidance, and consensus statement on management. Ophthalmology [Internet]. American Academy of Ophthalmology; 2017;124:1690–711. Available from: https://doi.org/10.1016/j.ophtha.2017.04.028. The article review and assemble information about myopic choroidal neovascularization concepts and recently developed treatments. Miyake M, Yamashiro K, Akagi-Kurashige Y, Kumagai K, Nakata I, Nakanishi H, et al. Vascular endothelial growth factor gene and the response to anti-vascular endothelial growth factor treatment for choroidal neovascularization in high myopia. Ophthalmology. 2014;121:225–33 Available from: http://www.ncbi.nlm.nih.gov/pubmed/23953100. Lumbroso B, Rispoli M, Savastano MC. Longitudinal optical coherence tomography-angiography study of type 2 naive choroidal neovascularization early response after treatment. Retina. 2015;35:2242–51. https://www.ncbi.nlm.nih.gov/pubmed/26457401. Querques L, Giuffrè C, Corvi F, Zucchiatti I, Carnevali A, De Vitis LA, et al. Optical coherence tomography angiography of myopic choroidal neovascularisation. Br J Ophthalmol. 2017;101:609–15. https://www.ncbi.nlm.nih.gov/pubmed/27531357. Soubrane G. Choroidal neovascularization in pathologic myopia: recent developments in diagnosis and treatment. Surv. Ophthalmol. 53:121–38 Available from: http://www.ncbi.nlm.nih.gov/pubmed/18348878. Ruiz-Moreno JM, Montero JA. Long-term visual acuity after argon green laser photocoagulation of juxtafoveal choroidal neovascularization in highly myopic eyes. Eur. J. Ophthalmol. 12:117–22 Available from: http://www.ncbi.nlm.nih.gov/pubmed/12022283. 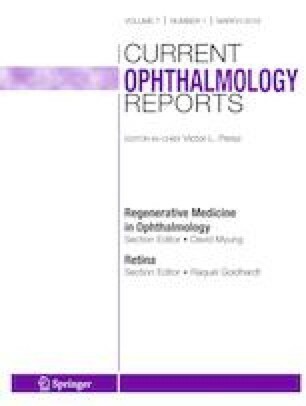 Schmidt-Erfurth U, Hasan T. Mechanisms of action of photodynamic therapy with verteporfin for the treatment of age-related macular degeneration. Surv Ophthalmol. 2000;45:195–214. https://www.ncbi.nlm.nih.gov/pubmed/11094244. Montero JA, Ruiz-Moreno JM. Verteporfin photodynamic therapy in highly myopic subfoveal choroidal neovascularisation. Br J Ophthalmol. 2003;87:173–6. https://bjo.bmj.com/content/87/2/173.long. Wolf S, Balciuniene VJ, Laganovska G, Menchini U, Ohno-Matsui K, Sharma T, et al. RADIANCE: a randomized controlled study of ranibizumab in patients with choroidal neovascularization secondary to pathologic myopia. Ophthalmology. 2014;121:682–92. https://www.ncbi.nlm.nih.gov/pubmed/24326106. Tufail A, Patel PJ, Sivaprasad S, Amoaku W, Browning AC, Cole M, et al. Ranibizumab for the treatment of choroidal neovascularisation secondary to pathological myopia: interim analysis of the REPAIR study. Eye [internet]. Nat Publ Group. 2013;27:709–15. Available from:. https://doi.org/10.1038/eye.2013.8. Tufail A, Narendran N, Patel PJ, Sivaprasad S, Amoaku W, Browning AC, et al. Ranibizumab in myopic choroidal neovascularization: the 12-month results from the repair study. Ophthalmology. 2013;120:1944–6. https://www.aaojournal.org/article/S0161-6420(13)00501-0/fulltext. Wu TT, Kung YH. Five-year outcomes of intravitreal injection of ranibizumab for the treatment of myopic choroidal neovascularization. Retina. 2017;37:2056–61. https://www.ncbi.nlm.nih.gov/pubmed/28590318. Ceklic L, Munk MR, Wolf-Schnurrbusch U, Gekkieva M, Wolf S. Visual acuity outcomes of ranibizumab treatment in pathologic myopic eyes with macular retinoschisis and choroidal neovascularization. Retina. 2017;37:687–93. https://www.ncbi.nlm.nih.gov/pubmed/27533774.